With Eternal Sunshine of the Spotless Mind, writer Charlie Kaufman (Being John Malkovich, Adaptation) has succinctly combined his innate quirkiness with his intuitive imagination to create one of the more ingenious yet simplistic love stories ever written. The title, taken from a poem by 17th century poet Alexander Pope, may be long and involved but it accurately paints the film's scenario: A love affair, even if it turns out to be a painful one, can never really be completely obliterated. Joel Barish (Jim Carrey), just another sad sack living in New York, is looking for love in all the wrong places, until he meets Clementine (Kate Winslet), an impulsive gal who changes her hair color as often as her mood. The two embark on an odd and wonderful yet tumultuous love affair, which ends badly. Distraught over the breakup, Joel finds out that Clementine has ''erased'' her memories of him on a whim, undergoing a procedure created by one Dr. Howard Mierzwiak (Tom Wilkinson). In retaliation, Joel decides to go through the same procedure, so medical techs Mary (Kirsten Dunst), Patrick (Elijah Wood) and Stan (Mark Ruffalo) pay him a visit, proceeding to hook him up to a machine, put him under and zap his brain. Yet, while re-experiencing his memories of Clementine just before they are erased, Joel rediscovers the reasons he fell in love with Clem and realizes he wants to hold onto those memories after all. Unable to regain consciousness, he devises a way to stop the procedure within the deep recesses of his mind, playing a sort of cat-and-mouse game and ''hiding'' Clementine from the memory zappers. Both leads play against type in Eternal Sunshine. Typical wild and crazy guy Carrey easily pulls off quiet and introspective Joel, which shouldn't come as much surprise; he has proven (The Truman Show, Man on the Moon) he is more than capable of handling dramatic chores. On the flip side, the usually prim and proper Winslet lets loose as the eccentric and wacky Clementine, swirling around Joel like a whirling dervish, making his life both gloriously happy and hellish at the same time but connecting with him in an extraordinary way. Wilkinson, Dunst, Ruffalo and Wood add their own refreshing characteristics to the film. Ruffalo (You Can Count on Me), with horn-rimmed glasses and messed up hair, is the techno geek who dances around in his skivvies, while Dunst, as ditzy Mary, gets the chance to show some real comic flair for once (Bring It On doesn't count). Turns out Mary actually has a major crush on the good Dr. Mierzwiak, played ever so smoothly by the always good Wilkinson (In the Bedroom). And Wood finally gets to take off his Hobbit feet and just be regular joe Patrick, an insecure guy who is just trying to find a little love in the world. With a few films--and two Oscar nominations--under his belt, it's gotten to the point where audiences go see a ''Charlie Kaufman film'' because they know it will be different; they know it will test conventions and turn genres on their heads. It's the kind of name recognition usually reserved for a director and/or star, rarely a screenwriter. But the fact is Kaufman truly has a remarkable gift in taking ordinary subject matter--in Eternal Sunshine's case, a simple love story--and turning it into something completely unique, occasionally weird and always fascinating. Eternal Sunshine shows the softer, romantic side of Kaufman's skewed psyche, and his work is definitely enhanced by director Michel Gondry. Having worked together on the blink-and-you-missed-it indie Human Nature, the two have turned in a nearly flawless second effort. Gondry's vision of Joel's memories matches the story's inventiveness, as Joel races around in his subconscious, grasping at straws and trying to keep Clementine in his head. In one particular moment, the beach house where Joel's last remaining memory of Clem takes places--the memory of meeting her for the first time--collapses around them as the images are slowing disappear as the memory is being erased. It's a distinctive and heartbreaking flash of visual brilliance. Oscar should come knocking once again. Eternal Spotless Sunshine…wait, Eternal Sunshine Mind That's Spotless--OK, so it's hard to remember the exact title. 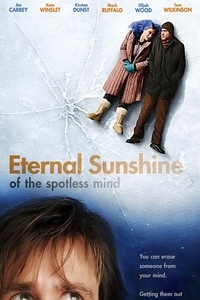 Nevertheless, with its thoroughly original look at love, Eternal Sunshine of the Spotless Mind (yes! ), will leave an indelible impression.